How to write multi lines in one Excel cell? I want to write multi-lines in one MS Excel cell. But whenever I press the Enter key, the cell editing ends and the cursor moves to next cell. How can I avoid this? Or, you can set this as the default behaviour by pressing the Wrap Text in the Home tab on the Ribbon. Now, whenever you hit enter, it will automatically wrap the text onto a new line rather than a new cell. You have to use Alt+Enter to enter a carriage return inside a cell. Edit a cell and type what you want on the first "row"
Note that inserting carriage returns with the key combinations above produces different behavior than turning on Wrap Text. In the screenshot below, column A has the carriage returns and column B has Wrap Text turned on. Changing the width of a column with carriage returns doesn't remove them. Changing the width of a column with Wrap Text turned on will change where the lines break. Alt + Enter never worked for me. I had to go to Format Cells and make sure that the Number tab was set to Text. That allowed me to see exactly as I had input. My issue could have been Mac specific though. Not the answer you're looking for? Browse other questions tagged microsoft-excel text-editing or ask your own question. How do you move between lines in a cell with multiple lines of text in Excel? How to copy multi-line text from Excel without quotes? How to run an event on Enter key in Excel VBA? 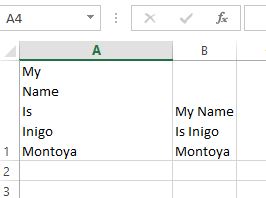 Can we set Excel to append cell text on key press instead to delete the current text? After pasting data, how do you navigate cell contents with keyboard arrow keys in MS Excel? Does Excel have a keyboard shortcut to find contents of selected cell?